A new Taub Center policy paper by Prof. Shlomo Yitzhaki examines the disadvantages of the current pension market and suggests replacing it with a nationalized pension system, which would both benefit citizens and provide income for the state. The study was presented at a meeting of the Lobby for Fair Pension headed by MK Michal Biran and MK Omer Bar-Lev, and the Knesset will vote on a proposed bill to establish a national pension fund. In Yitzhaki’s words: “The state has justifiably recognized that in order to prevent senior citizens from becoming a burden on society, people must have pension insurance. However, the state has erred in leaving citizens to manage their savings on their own.” Yitzhaki argues that much of the population is unable to monitor events in the capital markets and to understand the complexities of financial investment; therefore, such responsibilities should not be left to them. The solution, according to Yitzhaki, lies in transitioning to a nationalized pension system, which would lead to a more effective mechanism for contribution and oversight of pension fund money, reduction in management fees, and more generous benefits. Greater efficiency in pension contributions and supervision. The pension contribution system is currently in the hands of private companies that manage the funds. In contrast, regulation and oversight, which includes ensuring that employers and workers actually contribute the minimum amount to pensions as set by law, is in the hands of the state. This separation of responsibilities makes it challenging for the state to regulate private companies. According to Yitzhaki, this problem would likely be solved if the state itself deducted pension contributions from the employee’s salary, as it does for health insurance. Since the payment system is already in place for the National Insurance Institute (NII), inclusion of the pension contribution in this deduction would simply entail an increase in the total sum deducted by the NII. Lowering pension fund fees. In 2013, the Knesset Finance Committee decided to cap fund fees charged by two types of pension funds (provident and insurance funds) as of January 2014, with permitted fees of up to 1.05% of the total assets (i.e., the accrued savings plus return) and up to 4% of the contribution amount. “This law is intended to benefit savers,” says Yitzhaki, “although the average person still has limited understanding of pension fees due to the complicated calculations, especially because the legal cap on fees differs by savings fund type.” Yitzhaki examined the share of the returns that go towards management fees over time,for provident or insurance funds that charged the maximum fee in 2014 (Figure 1). The basic assumption, based on actuarial calculations, is that the average return stands at 4% per year. 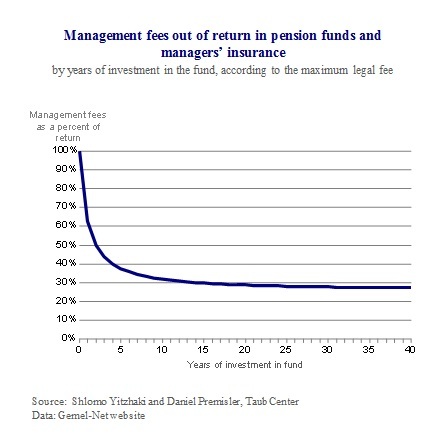 As shown in the figure, the management fees are 1% higher than the returns in the first year, meaning that the saver pays more in fees than he gains in profit even before he begins to realize any return on his savings. In subsequent years, the calculation changes as savings and returns accumulate and so, for example, in the second year, 50% of the return is lost to management fees, while in the fifth year, some 40% is lost. Even in the long-term, nearly 30% of the return goes towards management fees. In addition to the challenging calculations, Yitzhaki points to a number of other disadvantages of management fees in private pension funds. Firstly, in his opinion, the current method of fee collection is regressive and reduces social justice because an individual’s bargaining power with regard to fees grows as his salary increases. Secondly, fees are transferred from the investing public to fund managers and owners, instead of into the hands of the state to serve the public at large. Thirdly, the current fees are inflated relative to what is acceptable elsewhere (e.g., in the U.S., fees are limited to 0.5% of total savings). More generous pension benefits for savers. Private pension funds must remain balanced at all times (i.e., without a deficit) since rumors of a deficit could cause large numbers of savers to withdraw their money and lead the fund to collapse. In contrast, there can be no mass exodus from a nationalized pension system, because there is no alternative. Furthermore, nationalized pensions in Israel could take advantage of this flexibility to provide more generous benefits than private pensions, since they would be based on Israel’s high population growth rate (a rate of 1.5% per year that is expected to remain unchanged in the future). This growth rate in the labor force translates into growth in pension contributions. National insurance, which does not require actuarial balancing, can rely on the expected growth in contributions to provide current pensioners with a return that is at least 1% higher than the current 4% return for private pensions. In the Taub Center study, Yitzhaki recommends several key changes including placing fund management in government hands while leaving the money itself in the private market, allocating a portion of the investment funds in profitable public works, and making changes to benefit senior citizen investors. According to his recommendation, the nationalized pensions would be capped at a specific ceiling, for example, the average market wage, and any contributions based on an amount beyond this maximum would be managed as they are today. Yitzhaki’s plan calls for a governmental committee composed of experts that would serve as the administrator for the pension savings, while in turn transferring management to a pension fund chosen by tender. According to Yitzhaki, this process would disperse the investments and limit the shock that moving to a national pension system could create. In addition, he suggests cancelling the required pension deduction for workers who have already reached pension age, who are today required to continue pension deductions including payment of management fees. In order to prevent this illogical situation, he advises adopting the National Insurance Institute system whereby senior citizens (over age 70) who continue to work no longer pay deductions. Yitzhaki concludes the paper: “Privatizing pension insurance is another example of privatization that does not make economic sense. Pension privatization has a component that no one would object to – ensuring the future of the elderly among us so that they do not become a burden on society. Essentially, though, the system is transferring money from savers to the heads and owners of funds, under the approval of the Ministry of Finance.” The Taub Center policy paper shows that transitioning to a nationalized pension system is likely to lower costs, increase returns and improve the overall welfare of the investing public. For details, or to arrange an interview, please contact Gal Ben Dor, Director of Marketing and Communications 054 464 2333.